3.1 - Construction of dwellings and most buildings in Franklin County require county-issued building permits and inspections prior to use or occupancy. The permitting process not only helps assure you that your proposed project is in conformance with applicable state construction codes, but also that it is consistent with other requirements regulating property divisions and uses such as setbacks, minimum frontage, potable water supply, and sewage disposal systems. Before commencing construction, be sure you have obtained the appropriate permits for grading, flood plain development, and other activities that may require a permit. 3.2 - Not all lots are buildable. The Franklin County Assessor has many parcels that are separate for the purpose of taxation but are not legal lots in the sense that a building permit can be issued. You must check with the Franklin County Building and Planning Departments to verify that a piece of land can be built on. 3.3 - Easements may require you to allow construction of roads, power lines, water lines, sewer lines, etc., across your land. Check these issues carefully. 3.4 - Many property owners do not own the mineral rights under their property. Owners of mineral rights have the ability to change the surface characteristics in order to extract their minerals. It is very important to know what minerals may be located under the land and who owns them. 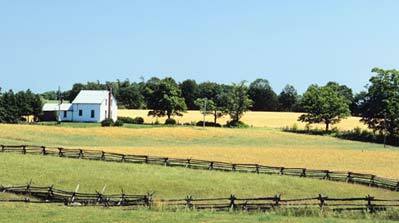 Much of the rural land in Franklin County can be used for mining, subject to current land use zoning standards. Be aware that adjacent mining uses can expand and cause negative impacts. 3.5 - You may be provided with a plat of your property, but unless the land has been surveyed and pins placed by a licensed surveyor, you cannot assume that the plat is accurate. 3.6 - Fences that separate properties can be misaligned with the property lines. A survey of the land is the only way to confirm the location of your property lines. Franklin County does not verify the location of property lines or become involved in property line disputes. 3.7 - Many subdivisions and planned unit developments have covenants that limit the use of the property. It is important to obtain a copy of the covenants (or confirm that there are none) and make sure that you can live with those rules. Also, a lack of covenants can cause problems between neighbors. 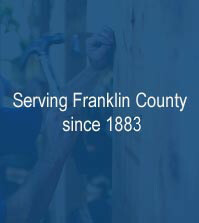 Franklin County does not become involved in the enforcement of covenants. 3.8 - Homeowner associations are often formed to take care of common elements such as roads, open spaces, etc. A dysfunctional homeowners association or poor covenants can cause problems for you and even involve you in expensive litigation. 3.9 - Dues are almost always a requirement of a homeowners association. The by-laws of the homeowners association will tell you how the organization operates and how the dues are set. 3.10 - Stormwater flows through most low areas at some time or another. If you build in these low areas, you may be flooded. If you fill in the low areas, you may be unintentionally relocating the flood waters that could cause problems for others. This type of action could lead to private civil actions in court. 3.11 - If undeveloped, surrounding properties will probably not remain as they are today. You can check with the Franklin County Planning Department to find out what the comprehensive plan designation for the area is, how neighboring properties are currently zoned, and what future developments may be in the planning stages. 3.12 - Water rights that are sold with the property may not give you the right to use the water from any streams or other sources crossing your land without coordinating with the water district, a neighbor who also uses the water, or DOH and WSDOE. Other users may have senior rights to the water that may limit your use or require you to pay for the oversizing or other improvements to the source. 3.13 - It is important to make sure that any water rights you purchase with the land will provide enough water to maintain fruit trees, pastures, gardens or livestock. 3.14 - The water flowing in creeks or streams may belong to someone else. You cannot assume that because the water flows across your property, you can use it. 3.15 - Flowing and standing water can be a hazard, especially to young children. Before you decide to locate your home near water, consider the possible danger to your family. 3.16 - Many creeks, streams, rivers, and wetlands are regulated by either the Franklin County Shoreline Master Program and/or the Franklin County Critical Areas Ordinance. These regulations establish setbacks and buffer zones adjacent to these various bodies of water. Natural vegetation cannot be disturbed in these areas. If you are contemplating development on property near water, marsh, or other wet areas, be sure to check with the Franklin County Planning Department before commencing any work.